Gum disease poses a significant threat to the long-term health of your smile. According to the Center for Disease Control, 47.2% of Americans over the age of 30 are suffering from gum disease. That’s 64.7 million people! And the problem gets worse as we age. For people 65 and older, this number skyrockets to 70.1%. The best way to prevent gum disease is to practice effective oral hygiene at home every day and visit your dentist for regular checkups. Unfortunately, millions of Americans don’t even realize that they have it. Gum disease is caused by bacteria which feeds on the plaque and tartar that grow on your teeth. Plaque is the filmy substance that forms on your teeth after you eat. If plaque is not removed by regular brushing and flossing, it can harden into tartar, the rough substance that your dental hygienist scrapes from your teeth during a professional cleaning. Gingivitis is the first stage of gum disease. People with gingivitis experience some pain and bleeding of the gums, particularly while brushing. Unfortunately, many people think that it’s natural for their teeth to bleed when they brush, but it isn’t. It’s a sign of a problem which will grow worse without intervention. The time to treat your gum disease is as early as possible. 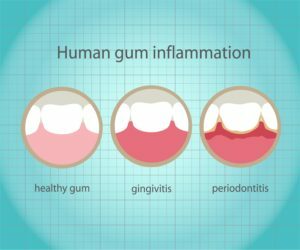 If you don’t take care of your gingivitis, it can worsen and become periodontitis, a far more serious condition. At this point, you must see your dentist right away to receive the appropriate professional care to counteract this devastating condition. Otherwise, you could end up losing several or even all of your teeth. If you notice one or more of the following symptoms, there’s a good chance that you are suffering form periodontitis. Not only will gum disease demolish your smile; it can also result in life-threatening medical conditions. This is not a problem that will go away on its own. If you think there’s a chance that you or someone you love is afflicted with gum disease, please contact our office and schedule an appointment right away.